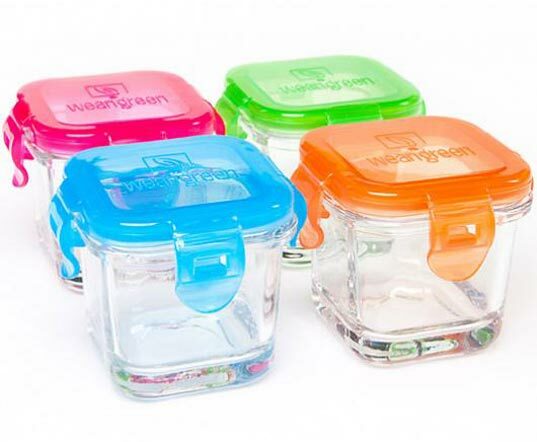 We’ve lauded the eco and health benefits of glass baby bottles, so of course we were thrilled with the news that Wean Green has introduced glass baby food storage containers to the green parenting scene! Not only are the 100% recyclable Wean Cubes non-toxic: BPA-, PVC-, phthalate- and plasticizer-free, and super stylish — available in four mouth-watering, vibrant hues: Raspberry, Blueberry, Peas and Carrots — they are also fabulously functional! Lids are securely held in place by four locks, and a silicone seal stops leakage and keeps contents airtight to prevent spoiling and freezer burn. The sides of Wean Cubes also feature measuring lines for easy portion patrol, (each cube holds four fluid ounces), and the Cubes may go from the freezer to the microwave to the table to the dishwasher! Best of all, Wean Cubes will live on long past the baby food years as convenient packaging to tote toddlers’ snacks or even storage for school or office supplies. We’ll never be weaned off a set of Wean Cubes! We've lauded the eco and health benefits of glass baby bottles, so of course we were thrilled with the news that Wean Green has introduced glass baby food storage containers to the green parenting scene! Not only are the 100% recyclable Wean Cubes non-toxic: BPA-, PVC-, phthalate- and plasticizer-free, and super stylish -- available in four mouth-watering, vibrant hues: Raspberry, Blueberry, Peas and Carrots -- they are also fabulously functional! Lids are securely held in place by four locks, and a silicone seal stops leakage and keeps contents airtight to prevent spoiling and freezer burn. The sides of Wean Cubes also feature measuring lines for easy portion patrol, (each cube holds four fluid ounces), and the Cubes may go from the freezer to the microwave to the table to the dishwasher! Best of all, Wean Cubes will live on long past the baby food years as convenient packaging to tote toddlers' snacks or even storage for school or office supplies. We'll never be weaned off a set of Wean Cubes!